CTA Skin Review - Highlight Your Call To Action And Increase Conversions! CTA Skin Review – Highlight Your Call To Action And Increase Conversions! If you want to make more money quickly, you only need to do one of two things. You need to either expand your reach and increase your traffic, or you need to do more with the traffic you’ve already got. Now I think it goes without saying that more traffic is always a good thing, but if that traffic isn’t making you any money then it doesn’t help much. Improving your conversion rate and doing more with the traffic you’ve already got is the best way to develop a profitable system that will serve you well over the long-term. Today, I’d like to share with you a plugin that will help you achieve that. CTA Skin is a new WordPress plugin that allows you to create unique, targeted call to action banners on specific WordPress posts or pages. You can see the skin I made for GetResponse in the picture above. These skins float along the bottom of the reader’s screen, and can be positioned to the left, right, or center as pictured above. You also have the option to make the box pop up after a certain number of seconds, which is a great option to use in my opinion. I’d much rather a potential buyer read a little bit about a product before being prompted to take action. The thing that is so great about CTA Skin though is that it’s so easy to make specific CTAs for specific articles, which drastically increases the likelihood that the reader is actually going to click the button. 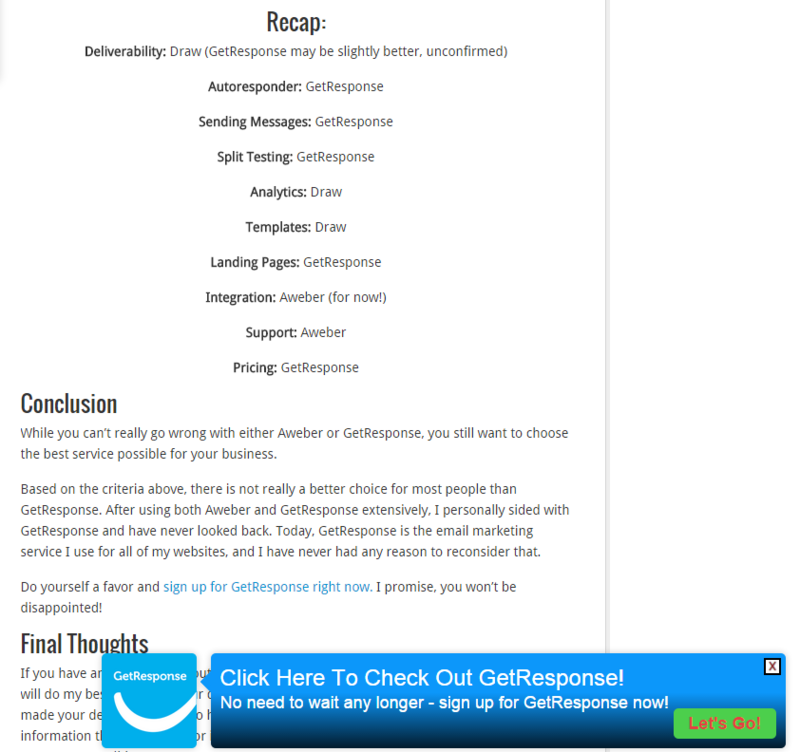 The article in the picture above is a review post comparing GetResponse and Aweber. Having a specific call to action to check out GetResponse after reading that article is extremely convenient, and tells the reader what they should do next. When I write an article about a different product, it will only take me a moment to create a new CTA skin unique to that product. I love that. Speaking of the creation process, let’s talk about that a bit. One of the things that makes CTA Skin so great is that the skins are completely customizable. I can’t tell you how many times I’ve visited blogs and have seen the exact same call to action boxes used. Half the time, I can tell which plugin a blogger is using just based on the style of their CTA box. This ultimately hurts both me and the blogger, because people are going to begin recognizing those boxes as advertisements and unconsciously ignoring them. The banner blindness effect is real, folks. With CTA Skin, everything from the button color to the font size is completely customizable. This means that not only will you be able to make your call to action boxes stand out, but this will also prevent the banner blindness effect from taking place because you likely won’t see the same two CTA skins on different websites. This is huge. CTA Skin wouldn’t be complete without split testing capabilities, and fortunately this works really well. I don’t have enough data (yet) to make any personal conclusions, but others have seen massive improvements from this feature alone. I have always believed that one of the key differences between good marketers and great marketers is that great marketers collect data, and use that data to make improvements to their system. This is made incredibly easy with CTA Skin. As you can see pictured above, one of the two skins had over twice the click through rate. One simple split test allowed this marketer to get twice the results. Could you imagine if he would’ve stuck with Easy Azon 1? It only takes a second to create a slightly tweaked version of a skin, so there is no reason not to be split testing with this plugin. It’s quick and the impact can be huge. Although making new skins is a quick and easy process already, this can be sped up further by creating default settings that you can load from. I welcome anything that saves time, so this was a nice feature. Links can be set to no-follow, and can also be opened in a new window. The content can be customized further by utilizing basic HTML commands, which is nice. You can choose whether or not you want to allow the reader to close the CTA box or not. I always leave this checked personally. You can preview your CTA skin in real time as you are working on it. This saves a ton of time and allows you to see exactly what your skin will look like once it’s live on your site. There are a few other features I’d love to see from a plugin like this that I hope will be added by the developers sometime in the future. I’d love to be able to add a call to action box somewhere in the middle of the page and have it stay there. Right now, the box floats, meaning it stays at the same position on your window as you scroll down. This is good a lot of the time, but I’d love the ability to simply embed the box somewhere in the page. While this can technically be done by taking a screenshot of the box and inserting it that way, you’ll obviously lose all split-testing and analytical features that help make this plugin so great. Another feature that I feel would help dramatically is being able to delay the CTA box from appearing until the reader has finished reading the article. In the article I mentioned earlier on Aweber vs GetResponse, I do not want the reader knowing I’m recommending GetResponse over Aweber until they finish the article. If the box were to pop up before they even began reading, they’d know my choice before they even read my content. I have no data to back this up, but I think in certain instances it would lead to more click-throughs if we had the option to make either the buttons bigger, or the entire box clickable. I see no harm in at least adding the option, anyway. What CTA Skin does, it does extremely well. Content on its own does not make money, so you need your visitors to take some sort of action if you want to profit from them. CTA skin is great at achieving this. 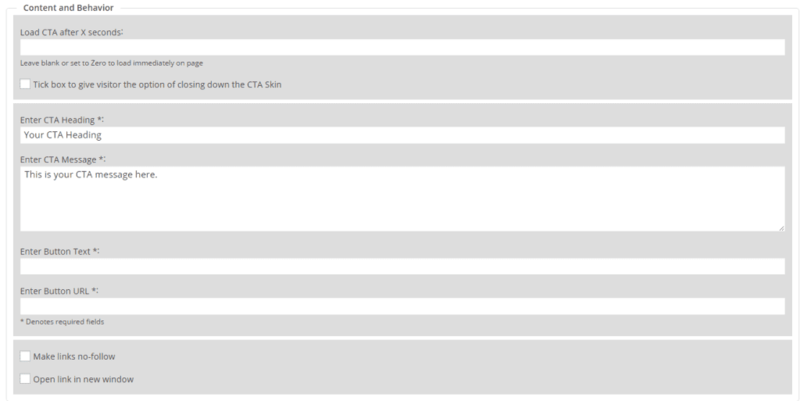 CTA Skin is priced very low at the moment, at only $17 for a single site license, up to $37 for unlimited websites. This is extremely cheap for a product that is practically guaranteed to pay for itself. It’s time to take action. Do yourself a favor and pick up a copy of CTA Skin right now. You’ll start seeing results almost immediately, and I guarantee you won’t be disappointed. Do Amazon Product Review Sites Still Work? What I like with this plugin is the simplicity. Enstine Muki recently posted…Nexttel Cameroon ~ Celebrating TWO Million Subscribers! Start Using CTA Skin Now! You're losing money by waiting any longer. Pick up a copy now!